READING: Picture Sight Words™ are a research-based, multi-sensory teaching tool that help children recognize and, thus, read sight words much faster. Picture cues allow a child to recall a picture instead of a letter - the picture provides a context that helps your child understand and recognize what the word says. Simply put, the picture tells a story which makes recalling the sight word easier. 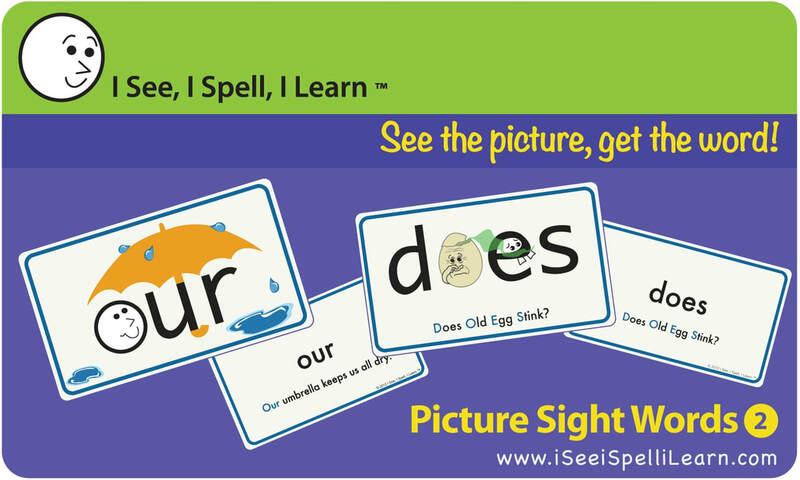 SPELLING: Picture Sight Words™ are the first cards that help a child spell sight words. The picture cue embedded in the word is in the shape of the tricky letter. Now when the child tries to recall that letter, he can recall the picture, which will tell him what letter it is because it has the same shape. The cards are not cluttered with confusing visuals. There is usually just one picture in the word, making recall easier. 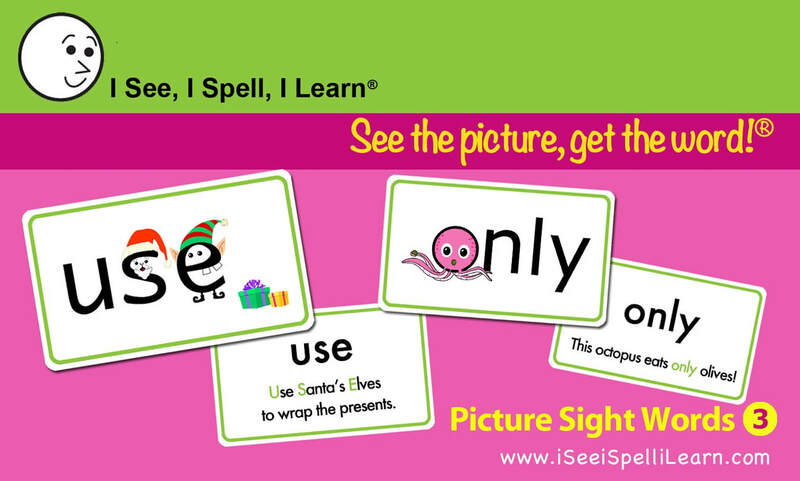 For the first time, your child can "draw" a word, and spelling sight words can become fun! COMPREHENSION: The sentence at the back of each card uses the sight word, and helps your child understand the meaning of the word in context. ​The program works best for emerging readers (4-8 years old), since the pictures keep younger children engaged. The cards can be used alone or as part of any reading or spelling program. These cards have proved to be a great learning tool for children with learning differences like dyslexia, since they use right-brained strengths of recalling a picture, instead of relying on the weaker left-brain to recall a sequence of letters which have no meaning to them. Instructions for reading: Show your child the card, and listen to the audio. Have your child repeat this 3 times. Flip the card and listen to the sentence. Have your child make up a sentence with the sight word. Flip back to the word and discuss the picture. Make comments like “Oh that’s a nice color!” or “Why do you think they used that picture?” or “What is the picture telling us about?”. The more you engage children, the more likely they are to remember the picture. Move to the next card. ​You can wait till your child can read all 25 cards before working on spelling, or you can start once reading 5 cards has been mastered. Learning to spell sight words takes longer than learning to read them, so patience is key! Instructions for spelling: Show your child the card and repeat the sentence as needed. Discuss the shape of the letter and show its connection to the picture cue and to the sentence. Help them remember the picture, rather than memorizing a letter over and over. For example, in the word "saw", if your child spells "sow" instead of "saw", repeat the sentence on the back of the card: 'Anna saw a purple tree'. Help your child recall the picture. You could ask, 'What letter does Anna loom like?' and show the picture if needed. You could ask, 'What letter makes the "A-Anna" sound?'. Gently lead your child to remember the missing letter is an A. Once your child has completed Set 1, move on to Sets 2 and 3, and then to Picture Homophones™. 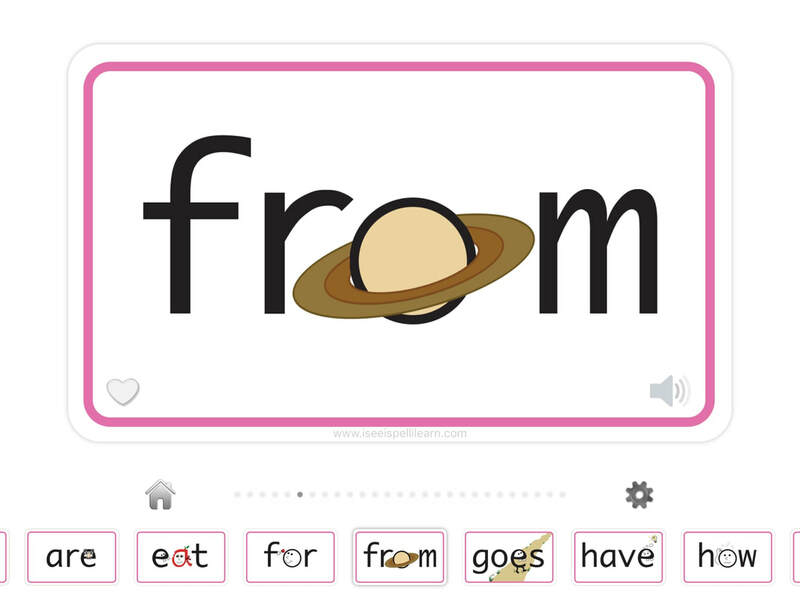 You can also purchase digital workbooks here from our web store if your child needs extra practice spelling these sight words. 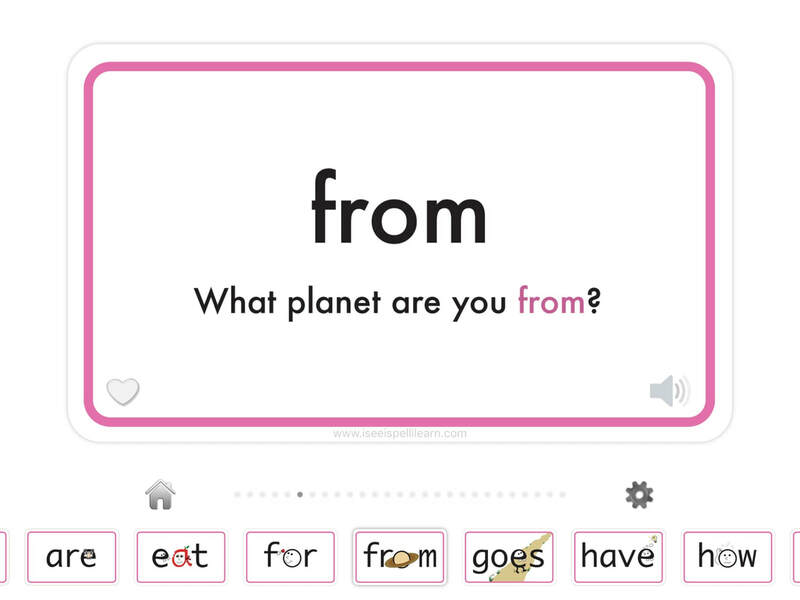 How to use Picture Sight Words™ App? This app has been specially designed to leverage touch interface on devices like the iPad and iPhone. Simply touch the icons, buttons or cards to select them and display the corresponding information. The bottom page of the app displays scrollable list of sets of cards, while the larger card above displays the currently selected set or card. Tapping a (double-sided) card flips it around. Swiping left or right on the card switches to the next or previous card in the set. The card wobbles if there is no next or previous card to display. A Zoom gesture is available on unlocked cards to view them in full screen, allowing focus to remain on the word or the sentence displayed. You can tap to flip and swipe left or right to view the next or previous card. Simply pinch the card to return to its normal size. The Favorites button allows cards that need extra work to be grouped and viewed in the Favorites Set, which automatically appears when at least one card has been marked as a favorite. The Audio button on the front of a card allows you to hear the selected word while the audio button on the rear, allows you to hear how the word is used in a sentence. A card is marked as completed once you hear audio for both the front and rear of a card. The Certificate card provides a summary of which cards have been completed, allowing you to easily track progress. You can reset progress on a card, set, or all sets from the settings screen by selecting the Reset Progress button. Resetting progress on all sets resets the app (progress is reset and favorites are removed). This allows you to easily get the app ready for a new user. The Home button allows you to return to the launch screen from where other sets can be selected to view. The Settings button brings up the settings screen where you can customize what sets are visible in the scrollable list, and reset progress for the current selection.